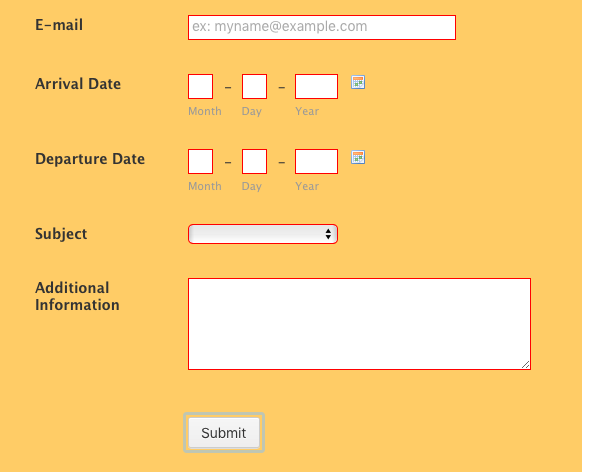 Hi, I am trying to style the forms so that it does not show the individual line error messages for required fields, but still shows the "There are errors on the form. Please fix them before continuing." message. I have successfully hidden all the warnings and red styling, please let me know if there is a way to still show the form error message that shows up when you click submit. The following CSS should remove the 'There are errors on the form. Please fix them before continuing.' warning message located below for submit button. It seems to be working properly on your form. To accomplish what you wanted, you should find the same rule (.form-button-error) and remove it completely. * I have just removed the duplicate entries. Do replace the current code (related to errors) with the one right above and it will work for you as you wanted. We will be replying to you there shortly.